WORDS…kind, hurtful, soft, exciting, loving, careless, frightening, inspirational words. Words have always been powerful and transformative for me. Even more so now, since I no longer write laden with the invisible ink of fear. To be able to write in the bright light of day with multi-colored hues, open to the vulnerability unearthed from the deepest shadow of my being, has been life changing. From the minute we awake to the moment we fall asleep, we are either giving or receiving words. There are words that move us. Words we wish we could take back. Encouraging words that make our day. Words that scare us into action. And words so exciting we can’t wait to share. Often it’s the words that are never spoken that hurt the most. Indifference painted across a face speaks volumes. It can be a simple, How are you?, knowing the person asking sincerely wants to know, that travels for miles in our heart. Encouraging words like – Good job! I love you. Way to go or I’m proud of you. As we evolve we realize that more often than not, it doesn’t take a multitude of words to leave a positive imprint on another human being. Many times words are difficult to say. Have you ever dreaded a conversation so badly you’d rather give birth instead? Words are easy and hard. Mirroring life in every direction. And sometimes when we’re not looking, life leaves us searching for words, only to find…there are no words. So we cry. We scream. We laugh until we cry and we repeat it all again until our words come back to us. We frantically attempt to rearrange the letters as if the Scrabble game timer is about to run out of sand. Eventually we learn to step away and think, realizing – we get another turn. So we anxiously wait for a vowel that will breath life into our consonants. That one precious vowel that makes it all make sense again. The words we tell ourselves are the most important words of all. They permeate through our soul echoing around us as we move throughout the world. So be kind to yourself – no matter what. Our actions are like vowels to words – without them, words have no meaning. They would merely be a confused jumble of letters that leave everyone guessing. 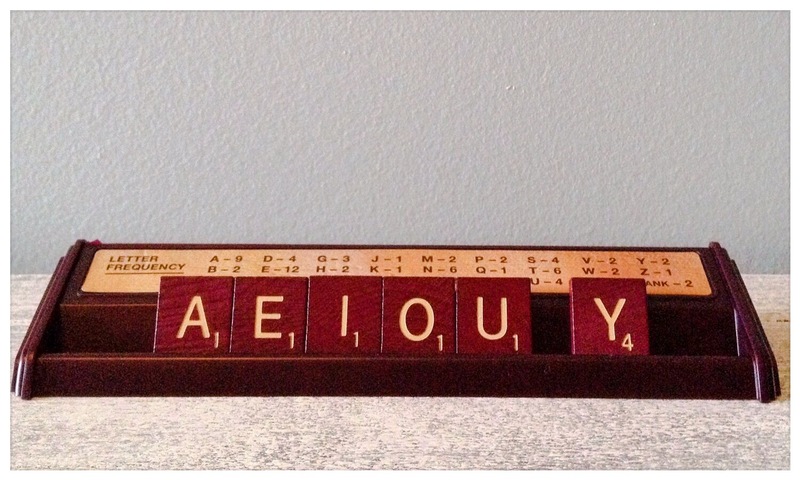 Vowels are the call to action for words. Their direction as to what to accentuate and what to leave silent. They tell us when to dance or when to sit it out. Accordingly, we align our words where they’ll have the most impact. We cautiously weave them through another, hoping for a seamless fit – where it makes the most sense on the Scrabble board of life. Without vowels the written word has no clarity. This entry was posted in Inspiration and tagged Hemingway, Inspiration, life, NESTpirations, spoken word, words, written word. Bookmark the permalink.